Check out the latest digital issue of Paintball X3 Magazine, Live & Free right here. 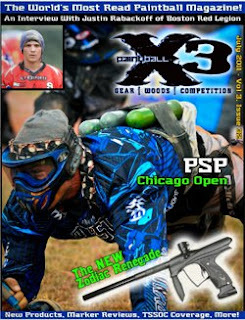 The issue of a whopping 132 pages and features full coverage of the PSP Chicago Open, Millennium Series Campaign Cup, a Review of the new Zodiac Renegade Marker, a Tour of the Ninja Paintball Factory, Interviews with Greg Hastings and Justin Rabackoff, Vietnam Patrol Scenario Game, More from Oklahoma D-Day and MUCH more. Check it out. Neues von der K1 von "Modern Combat"
Paintball Aachen: Welche Möglichkeiten gibt es?